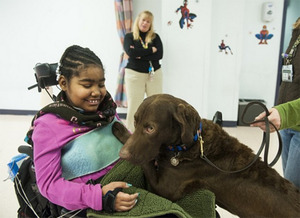 Chesapeake Bay Retriever Lewis has a very important job at Baltimore’s Kennedy Krieger Institute — helping 8-year-old Asheauna Pryor learn to move her arms and hands again. In December 2012, Asheauna had surgery to remove a tumor from her spinal cord. While doctors were able to eradicate the abnormal growth, the procedure damaged Asheauna’s spinal cord, leaving the little girl unable to move her arms or legs. She now requires a wheelchair to get around. Soon after her surgery, Asheauna came to stay at the Kennedy Krieger Institute, a hospital that helps children who have suffered devastating injuries regain mobility and re-learn the skills they need to perform daily activities. The Kennedy Krieger Institute isn’t your typical hospital — while the children and teens in treatment do undergo therapy that is key to their recovery, they also get to let loose and have fun during field trips and cooking lessons. But by far, one of the best additions added to the Kennedy Krieger rotation is its new animal-assisted therapy program. First initiated five months ago, the program brings therapy dogs like Lewis to the facility to visit the kids in their care. In addition to providing the children with much-needed love and moral support, the therapy dogs participate in special exercises that teach the kids important life skills, like how to grasp or throw objects, or how to better get around in their wheelchairs. It is because of this program that Asheauna was able to meet her new buddy Lewis. While Asheauna has worked with several dogs during the course of her therapy treatments, spunky 2-year-old Chessie Lewis is her clear favorite. “I like him because he’s active,” Asheauna explains, preparing to play her favorite game with Lewis — hide and seek. While Lewis and his owner-handler Amy Wernecke stand outside of the hospital room, Asheauna gets to work hiding Lewis’s toys and favorite ball, which Lewis will need to sniff out when Asheauna calls him. It sounds like nothing more than a fun game between girl and dog, but hide and seek with Lewis and his toys is teaching little Asheauna to use her arms and her hands again. Wernecke believes it is Lewis’s extraordinary temperament that makes him such a great therapy dog. While most Chessies are fairly high-strung, Lewis’s gentle nature and his extensive training make him a great member of the animal-assisted therapy program at Kennedy Krieger. Visits with the dogs are also important to the Kennedy Krieger kids who are having a tough time during their hospital stay because they miss their pets back home. Therapy dogs like Lewis help give patients like Asheauna, who misses her American Pit Bull Terrier Dre terribly, a sense of normalcy. “This really helps them feel like they have a sense of home,” program head Sherry Fisher tells The Washington Post. Lewis seems to have made all the difference in Asheauna’s therapy, explains therapist Kaitlin MacDonald. “Using the dog is such a motivator to get her to do the things we need to do every day and make it a little more fun for her,” says MacDonald. Asheauna agrees — after spending weeks with her new buddy Lewis, petting his fur with hands she’s just learning how to re-use and accompanying him on trips down hospital hallways, Asheauna says she will never forget him. “Lewis is going to be in my scrapbook,” she says. For more information on the Kennedy Krieger Institute or for updates on their animal-assisted therapy program, check out the hospital’s Facebook page.